At the heart of the Poorvu Center for Teaching and Learning, the multipurpose learning commons welcomes visitors accessing the space from the 301 York Street entrance. The bright and open lobby features a welcome desk and numerous touchdown spaces for students and faculty from across the campus to work, collaborate, and engage in conversation. One of the Poorvu Center’s guiding principles includes promoting a campus culture of open discussion about teaching and learning. The Learning Commons fosters a collaborative environment with modular seating that can be easily configured to suit the needs of a group and mobile media stations facilitate collaboration on and off-site. 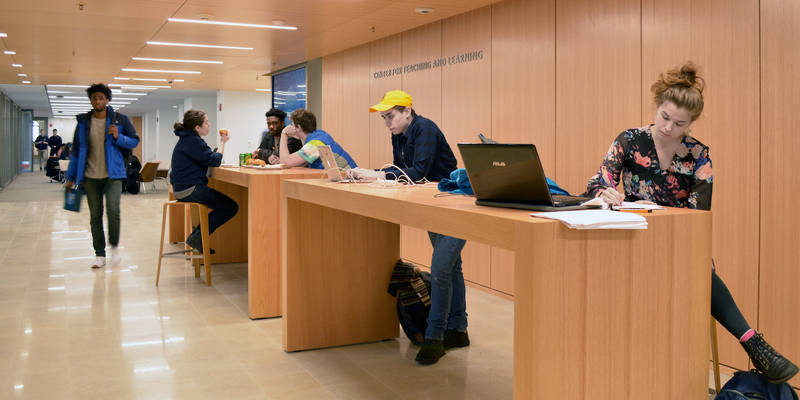 The learning commons also serves as a highly visible corridor connecting the Poorvu Center to the Irving S. Gilmore Music Library and the Sterling Memorial Library nave. This new, high-traffic passageway provides a direct route between the library’s Cross Campus entrance on High Street and the York Street entrance. The learning commons, or touchdown space, is open to all faculty, staff, and students while SML is open. The space closes 30 minutes before the library closes each night.